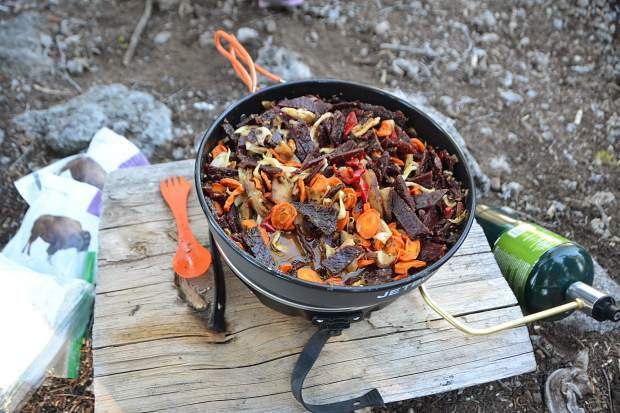 Adventure Dining Guideâsbourbon buffalo stew was part of a four-course meal served in the backcountry by Michelle Shea during a womenâs wilderness overnight trip on Saturday, June 17. Bourbon buffalo stew at the end of hiking all day in the backcountry, followed by dessert, and then Bloody Marys with pancakes for breakfast the next morning might sound a bit exotic, but when Tahoe City’s Michelle Shea is around those luxuries become commonplace. Through her company, Adventure Dining Guide, Shea has amassed dozens of lightweight, easy-to-cook recipes for those heading outdoors, and will be leading backcountry-cooking demonstrations throughout the summer months. On Saturday, June 17, Shea took 11 women into the forest for an overnight trip as part of Alpenglow’s Mountain Festival for the Women’s Desolation Wilderness Overnight Trip. The group didn’t exactly end up roughing it. Not if that includes dining on a four-course meal in the wilderness. During the evening the group dined on appetizers of cheese, smoked salmon hand rolls, bourbon buffalo stew, followed by dessert around a campfire. As a competitive snowboarder, Shea said she got the idea to begin toying with different foods and recipes after seeing other cultures cooking on the mountain and backcountry. From Asian spring rolls to ceviche, Shea has found ways of bringing an assortment of different foods to outdoor activities. Her website, AdventureDiningGuide.com, offers pages of recipes categorized by type of outdoor activity, course, main ingredient and cooking style. Shea said one her favorite recipes of late has been trail pickling, a process she said is simple to do and is nutritious. Not only do the vegetables provide for a healthy option, but also Shea said the pickling juice itself has a number of benefits, including helping with hydration. Moving forward, Shea said she plans on hosting roughly six backcountry, pop-up cooking demonstrations over the summer months, where she’ll take groups of people out and show them how to prepare meals in the wilderness. “The education side of it is really interesting to people because once you see how simple it is to make some of these foods in the backcountry, they go, ‘Oh I can do that.’ And that’s what I want. Then they can share that experience and it starts this whole cycle of bringing good food into the wilderness,” Shea said. Shea said she doesn’t yet have dates for the demonstrations. Instead she plans on centering them around good weather, and will send out information through her email list on AdventureDiningGuide.com for those interested in signing up.